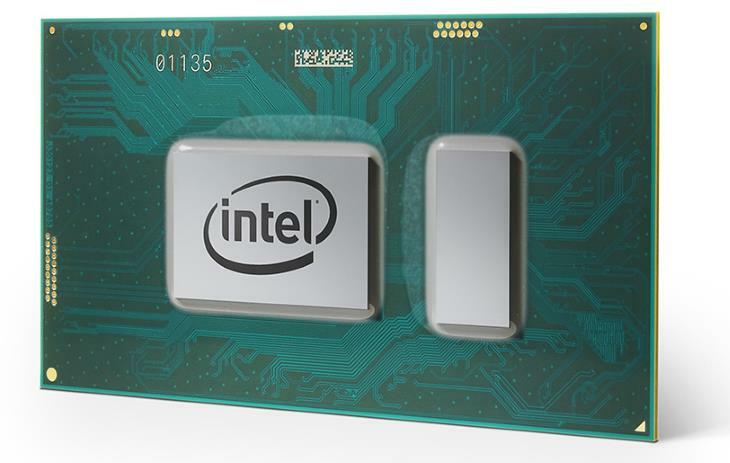 The 8th Generation Intel Core i5-8250U is one of the first quad-core processors in the mainstream Core U lineup. It’s an important chip on the market since upgrade from the previous dual-core U-series processors to quad-core is a big leap. That’s visible in the i5-8250U benchmark results. Extra performance over its 7th Gen i5-7200U dual-core counterpart while retaining low (15-Watt) power consumption and low heat is a great achievement. 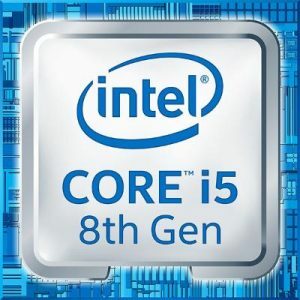 The Intel Core i5-8250U will be therefore a great choice for those who want fast laptop computing without sacrificing portability or battery life. The User Benchmark CPU test also shows the i5-8250U is close performance-wise to the power-hungry 45-Watt quad-core i5 and i7 HQ series. However, it’s worth noting that software applications running on a single computing thread won’t benefit from the chip’s four-core (and eight-thread) design. In our real-world tests, the i5-8250U proved its amazing performance for day-to-day use. We tested the i5-8250U in an HP 470 G5 laptop with 16GB of dual-channel RAM and a solid state drive. We put the CPU through some common everyday-use application tests, like web browsing, work in Microsoft Office applications, and multimedia playback. The i5-8250U had no problems with crunching these tasks and the CPU utilization was quite low. These aren’t too demanding tasks. They can be easily handled by the previous dual-core i5-7200U, too. So, the difference between the two chips wasn’t noticeable during these activities. However, when we stressed the CPUs a bit heavier, the i5-8250U showed its greater potential. For instance, a minute and a half long video was exported from Microsoft’s Movie Maker to a 1080p video file in 42 seconds on the laptop with the i5-8250U. The same tasks took 55 seconds on the i5-7200U-equipped notebook. The advantage of the 8th Gen chip was also somewhat visible when applying filters on large jpeg picture files. As for 4K video playback on the i5-8250U, it’s completely smooth. Playing various 4K Ultra HD video samples including 60fps ones in popular video apps consumed only up to 3% of the processor capacity. Playing random 4K YouTube videos in Chrome browser consumed up to 5% of the CPU power. Of course, playing 1080p Full HD and lower-resolution videos was a piece of cake. The processor’s operating temperatures on the tested laptop were quite low. Under normal workload with a couple of browser tabs, MS Word, and MP3 player running at the same time, average CPU temperature was around 40 degrees Celsius. The laptop was only mildly warm on the bottom of the chassis. Under full 100% CPU load while exporting a video from Movie Maker, the average temperature rose to around 70 C. The laptop got warmer on the bottom, which is normal, but still it wasn’t hot. Please keep in mind that CPU temperatures greatly depend on CPU cooling of each laptop model, so temps on them may be different than those presented here. 8th Generation Intel Core "Kaby Lake R"
Hi all, any help much appreciated. 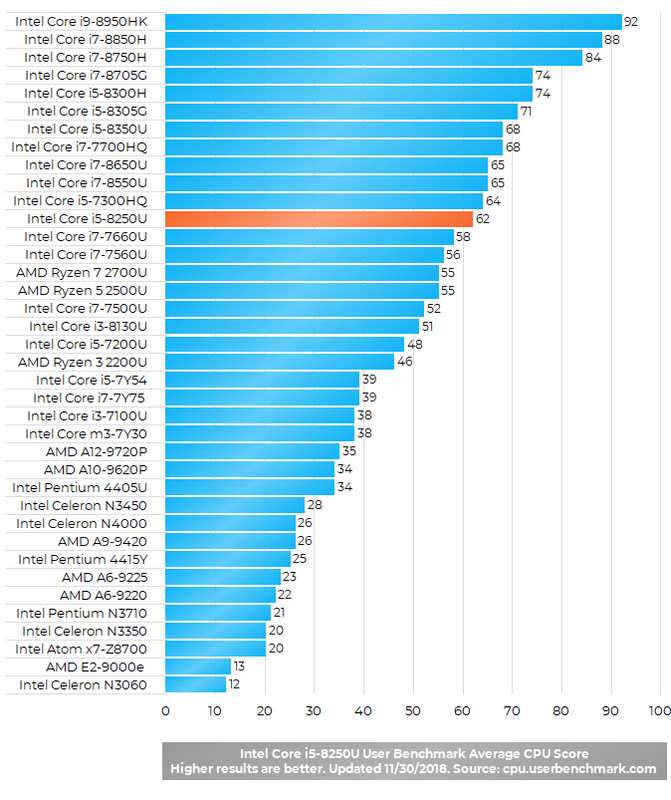 The i7 + 940MX combo is noticeably better for gaming than the i5 / UHD 620. But if you play games that aren’t GPU-demanding like Football Manager or some quite old titles like the original Sims, than the difference can be small. However, as soon as you run something mid-to-heavy like CSGO, Skyrim, Overwatch, Fortnite, PUBG, or the latest Sims, then the difference will be much bigger in favor of the i7 + 940MX. Holy is this thing fast. On day-to-day tasks, it works like theres no blockade to ever exist in front of it. On gaming, however, the Intel UHD 620 isn’t really the best. On a Mid-2018 HP Spectre x360 with SSD and 8 GB Of RAM, games like CS:GO and World o WArships require a crank-down to 720p, which is still HD, but not as High-Def as 1080p. Overall decent processor, should be the absolute baseline or all laptops. PS: My ancient dinosaur laptop, a Dell Inspiron M5030 with the notorious heating problem, is 7 1/2 years old and I have had it for 4 years already and it runs like a top…it outruns the wimpy Intel Core i5-8250U processor (which is a joke) 15 ways to Sunday!!! 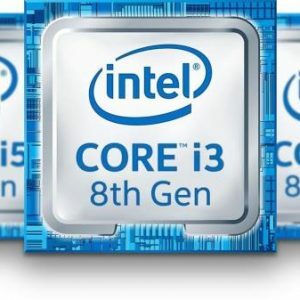 Intel i5-8250U processor? Pure trash!!! I am in the process of returning a brand-new laptop with this trashy, wimpy processor. I put Linux on the laptop and can barely open 1 tab in the web browser without it freezing up, and locking up and wait 15 min for it to finish so that I can open another browser tab. My ancient dinosaur laptop, a Dell Inspiron M5030 with the notorious heating problem, because of poor design of the heat-sink right over the processor, runs rings around this junky processor. The AMD Athlon II P-360 dual-core, 64-bit processor with 4 GB Ram, can open 8 browser tabs with no problem…with Intel’s trashy processors, can only open 1 browser tab before it locks up…in spite of having 12 GB Ram along with a 2 TB hard drive. Wow!!! AMD rules…my brother who used to fix and sell laptops was right…AMD processors run rings around Intel’s trash…any day of the week. AMD has made me a believer…boo to intel and hooray for AMD!!! Is this cheap marketing AMD vs Intel promotion?Well it is trully cheap.AMD is for those who dont want to spend money to more expensive rigs.I have been using AMD and Intel rigs for 18 years and only real deal AMD vas made is Athlon XP CPU s in the early 2000 s…Rest of the line is simple cheaper and slower.Period. Can I edit panasonic 4k video which I took by using Panasonic software? I want to get a 4k photo from a 4k video. 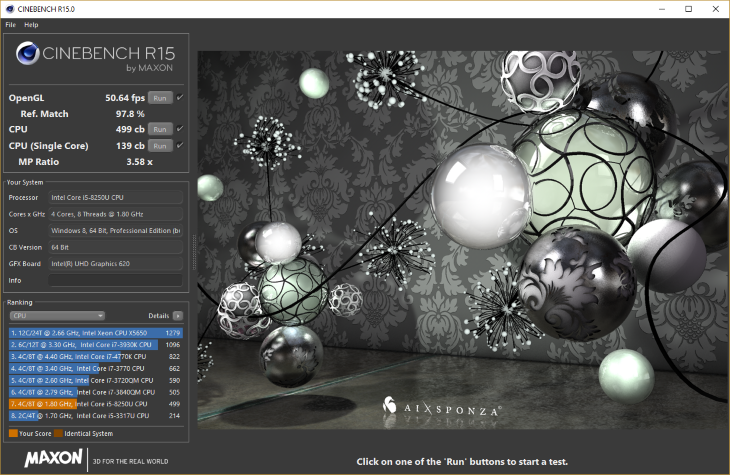 Do you have Cinebench of the processor? I want to compare it to my old laptop. Thanks. Hi, 499 cb multi-core, 139 cb single-core, 50,64 fps Open GL. Based on the benchmark and real-world tests presented on this page, I’ll give the i5-8250U 4 out of 5 stars. The CPU itself deserves 5 stars because of great improvement over the previous-gen i5 counterpart and overall great performance without producing excessive heat. But, its integrated graphics hasn’t been meaningfully upgraded. That’s why the i5-8250U received a star less.